Completing a two-week extreme makeover, ultra-luxury Crystal Cruises reveals chic, redesigned major public spaces onboard Crystal Symphony, including the Avenue Saloon, Palm Court lounge, Galaxy showroom, Hollywood Theatre, Bridge Lounge, Fantasia and Waves “junior cruisers” areas, and the Tender Landing/passenger boarding area. This latest triumph marks the culmination of a $65 million, five-year plan to redesign every room onboard the award-winning ship. Other invigorating new touches include “bells and whistles” added to all staterooms, paddle tennis court resurfacing, sprucing of tender shuttles, more energy-efficient hull paint, galley updates and general maintenance and detailing of the entire ship, from propellers and boilers to the bridge and lifeboats. Three interior design companies from the UK and US created the visions for the new spaces: Adfecto and SMC Design from London and KNA Design from Los Angeles, with inspiration culled from classic tony icons like New York’s 21 Club, Hollywood’s Coconut Grove and Palm Beach country club life. With lighting being such a key creative consideration, Crystal and designers also worked with DPA Lighting Consultants to add to the design’s drama, ambiance and environmental-friendliness. KNA’s redesign of signature lounges Avenue Saloon and Palm Court sets the perfect, lively backdrop for taking advantage of Crystal’s newly all-inclusive fine wines and custom-crafted cocktails. The panoramic-view Palm Court sparkles as the jewel in the crown on top of the ship, recalling the glamour-filled Coconut Grove of Hollywood’s yesteryear, yet also delivering a sleek, uber-contemporary wow factor. More intimate, modern lounge seating in buttery soft leathers surrounds a larger, spiral-design dance floor and slick, stainless and hand-tiled mosaic bar. Flooring is a mix of white, laser-cut Calacatta marble, soft grey swirling wood, and carpeting with a bold, large-scale, graphic — a pattern that is complemented by the reflective, decorative ceiling around the bar’s perimeter. Together, aqua, chartreuse, ash and cream jewel tones create a “light” California ambiance that helps bring the outside in during daytime tea and view-gazing. New lighting, including stunning, faceted Lucite wall sconces and shimmering Murano glass table lamps, transforms the space into a dreamy destination for evening dancing and drinks. The emblematic palm theme endures in pillow fabric, Sago palm trees and a dramatic rock crystal, branch ceiling feature above the spacious dance floor. Six-foot-tall, lit alabaster urns, suede wall upholstery, electric window shades, and state-of-the-art Meyer speaker and audio control systems further accessorize the look and sound of this enchanting social destination. Avenue Saloon and piano bar retains its 19th-century gentlemen’s club feel, but incorporates updated colours, furnishings, materials and music and seating configuration. Rich mahogany-panelled walls, leather upholstery, brass nailhead trim, sumptuous velvets and thick, lush inset rugs remind one of a days-gone-by country house. Heavily shuttered windows frame regal burgundies, golds, caramels, moss greens and ivories that warmly embrace guests. The inviting piano relocation allows for increased seating and conversation area choices, including new brass-tack couches, embossed-leaf barstools or tufted booths. New romantic lighting, sumptuous crown molding, antique-style trunk tables, custom artwork and audio systems add to the salon atmosphere. Old Hollywood panache also extends into Crystal’s entertainment showrooms, the Galaxy Lounge and Hollywood Theatre, with an air of British tradition, thanks to the spaces’ two UK designers. With diamond-patterned glass doors, lustrous gold fabric panels, black Nero Marquina marble flooring and large LCD digital signage screens, a new, contemporary entrance to the ship’s live performance showroom immediately tells guests they’re in for something special once inside the Galaxy Lounge. Through the entry, crystal lighting features, reminiscent of a dressing room mirror and starburst-designed carpet and wall lights help create a galactic home fitting for Crystal’s star guests and performers. Royal purple and old gold curtains in sheer and velvet fabrics envelop the space, including the main stage and side walls, in royal theatricality. New, modern mohair seating, cocktail tables and under-banquette lighting add comfort and drama. Throughout, SMC Design includes artwork niches with abstract figurative sculpture and a harmonised colour scheme of lively lilac, pink and crimson shades. A new stage extension that expands performance space by 30%, plus cutting-edge tech enhancements such as a new sound booth, show control systems, high-definition Barco projection, infrared video cameras, stage lighting and Meyer speaker system bring guests on the high seas even closer to Broadway. Classic, Art Deco movie palaces and the stars of the silver screen inspired Adfecto’s re-do of the Hollywood Theatre, Crystal’s elegant space for feature films and presentations. New smoked wood-grain walls and velvet damson-coloured curtains create a sweeping entry, while decorative and underseat lighting provides a warm ambience and soft glow. Crisp, architectural lines prevail in the design of knife-pleated pendant wall lamps and high-back, ivory-coloured leather theatre seating — a contrast to the circular starburst patterns in both the carpet and custom-woven acoustic wall-panelling. An additional, damson wall covering of crushed silk texture synchronises with dark umber, taupe and pearl earth tones and bronze-coloured ceiling and metal trim. New “stage” lighting, boosted surround sound audio processing from Bose® and Meyer, top-notch Barco high-definition projector and enhanced lecture, recording and presentation control systems, further transform the space into a luxury screening room. Whether playing together or alone, Crystal Symphony’s play/games areas for kids, teens and adults have been transformed for family recreation. Crystal’s dedicated Junior Cruisers’ areas, Waves (teens) and Fantasia (children), have been re-designed by Adfecto for savvy stylistas-in-training, acknowledging that the spaces’ patrons are fashionable young cruisers who already have a strong sense of what’s cool and sophisticated — while also providing versatility for a wide range of ages and activities. Scarlet, pistachio, denim blue and magenta pink colours differ from typical “primary” kids colours and inject vibrancy into the sophisticated, warm grey and neutral base wood-grain colours. Dramatic graphic harlequin carpeting; custom, digital-printed wall covering; Marimekko-patterned, FatboyTM bean bags; ‘70’s-classic, multi-coloured Casala Casalino chairs and tables; and multiple oversized sofas, including a huge Walter Knoll Circle sofa, together, create a trendy urban loft/modern rec room look that kids can “own”, be it curling up alone with a book or piling on the couch with new friends for a movie night. The areas’ divided layout has been reconfigured to create more privacy for teens and more of a welcoming, home den feel for younger children — while also allowing flexibility for the space to be opened up into one. Different sections for group activities/crafts, storytime, relaxation, videogames (Wii, PlayStation®, Xbox, Kinect) and screenings (two wide-screen TV’s, Blu-ray players and movie projection system) encourage personal expression. New lighting features and Bose® speaker system help create different atmospheres and transform the entire space into an exclusive teen hangout at night. KNA has transformed the Bridge Lounge into the perfect, classic card room — reminiscent of Palm Beach’s tennis and card clubs during the Gilded Age — with ambient sconces flanking wooden built-ins, frosted mirrors and saffron panel-covered walls. Soothing ocean blues and teals keep nerves calm during Bridge, board games or spirited speaker sessions. Other new accents include floor-to-ceiling drapes, Roman sheers, modern chandelier and a 12K gold, champagne leaf, dome ceiling that enhances the wall design. New podium, credenza and A-V systems, along with new convertible game tables and armchairs, provide room versatility and expert-level presentation tools. In addition to Crystal-sprucing of the tender shuttles that transport guests to and from anchor ports, Adfecto has designed a comfortable and welcoming foyer for the Tender Embarkation Area. A hint of signature seahorse turquoise, with design references from other public areas of the ship, reminds guests they are back on Crystal immediately upon stepping off the gangway. Aged teak, plank-style flooring, a sky blue ceiling, bright lighting and multi-coloured, striped canvas curtains (a la the ship’s poolside furniture) evoke feelings of being out on deck. Contemporary benches and boldly-coloured, five-foot-tall travel photographs from around the world provide comfortable seating and global-inspired eye-candy when waiting to pass through the space. New electronic “do not disturb” doorbell systems — a big success after installation on Crystal Serenity last year — were added to all staterooms, as were new cordless digital telephones. Penthouses also received new glass shower doors. Smaller-level updates included a complete refresh of the paddle tennis court, new stoves and cooking equipment in the main galley, environmental upgrades for lighting and boilers and a new, energy-efficient hydrogel hull paint that mimics the low-friction characteristics of a shark’s skin. The scheduled dry dock also boasted a massive cleaning and maintenance detail of the ship’s entire exterior and interior. An update to stateroom veranda furniture is also scheduled to follow shortly after the dry dock’s end. With the refurb taking place at Hamburg’s Blohm + Voss shipyard, four 20’ containers of Crystal Symphony furniture were donated to Hamburger Tafel, a charitable organisation that has extensive outreach into local, under-privileged communities. Thanks to transportation assistance from fellow goodwill organisation, Stilbruch, hundreds of chairs, stools, tables and cabinets will be given directly to Hamburg area residents-in-need. Crystal Symphony is now sailing her first of seven all-inclusive Baltic and Northern Europe cruises this summer before sailing across the Atlantic for a New England/Canada season this autumn. 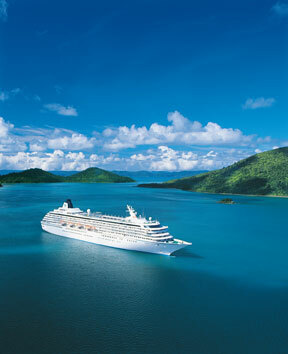 Until 30th June, Book Now fares for a 2012 voyage onboard Crystal Symphony start from £2,364 per person (based on a seven-night New England/Canada cruise departing 14th October), with seven- to-18-night options also offered in the Panama Canal, Mexican Riviera, South Pacific, Australia and New Zealand. Crystal’s passion for taking care of guests in an inviting environment of extraordinary space, quality and choices has earned the company more “World’s Best” awards than any other cruise line, resort or hotel in history. A keen focus on design has also earned the line numerous industry design honours, including first-ever awards from Hospitality Design magazine and the Association of Retail Environments (A.R.E.) in 2012.